The Union Rescue Mission is a 501(c)(3) nonprofit organization dedicated to serving men, women, and children experiencing homelessness. It is one of the largest rescue missions of its kind in the United States and the oldest in Los Angeles. This playground on the rooftop of the Union Rescue Mission provides a play area in a densely populated city where open space and safe playgrounds are lacking. 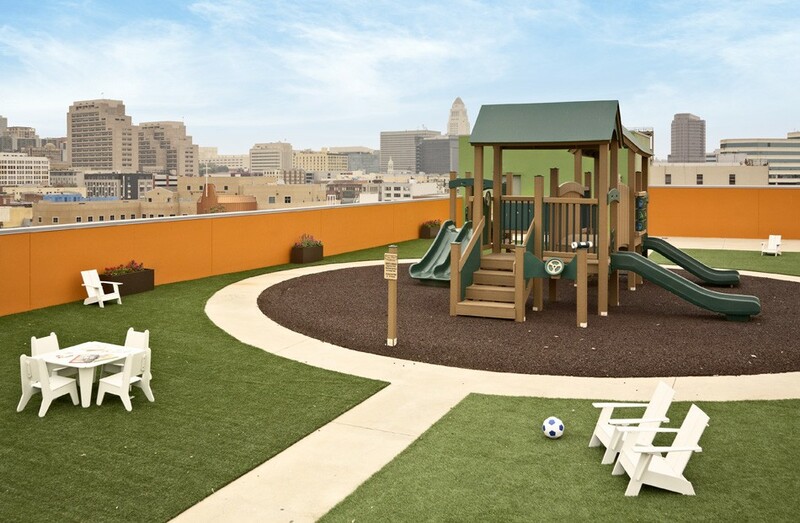 We were honored to be able to help make a difference in the lives of underprivileged children in Los Angeles with this rooftop playground. The playground features bound RubberMulch as an attractive, resilient safety surface below the play equipment. PolyTurf synthetic grass was utilized around the playground perimeter to create a fun, outdoor area for children to play.